First boot I owned. That info sheet seemed almost magical to me at the time--it felt like some sort of initiation into a secret society somehow. Even if the record itself was in terrible shape--I don't know if all copies were terrible, but mine skipped from the first play..
Massively disappointed by this. This is the kind of thing I would expect them to release years down the line when they are starting to run out and scraping the bottom of the barrel. 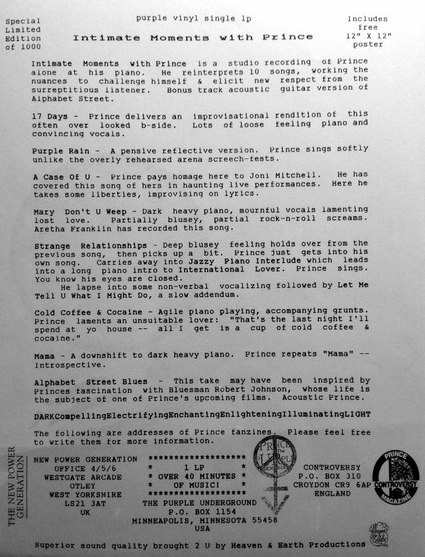 Whoever made the decision to release what are simply Prince sitting at the piano working stuff out as a stand alone release is a complete idiot. Maybe, just maybe include these as a part of a box set but not as the first proper posthumous album. I will not be buying this. I'm totally fine with this. I'm guessing the real outtake releases take more time: What should be the concept behind it? As part of album re-releases or on their own? Do they have the master tapes available? Are they cleaned up already? Who own the rights, who will release what? Are all legal questions taken care of? And honestly I don't know how anyone expected anything else. It's this for the moment or nothing. Some of you have 10 times more Prince music than the estate / WB. You'll be lucky to get something in 1 out of 10 releases that you don't already have on a bootleg. Do some of y'all expect the estate / WB to personally ask you which release is "overwhelming" specifically to you? 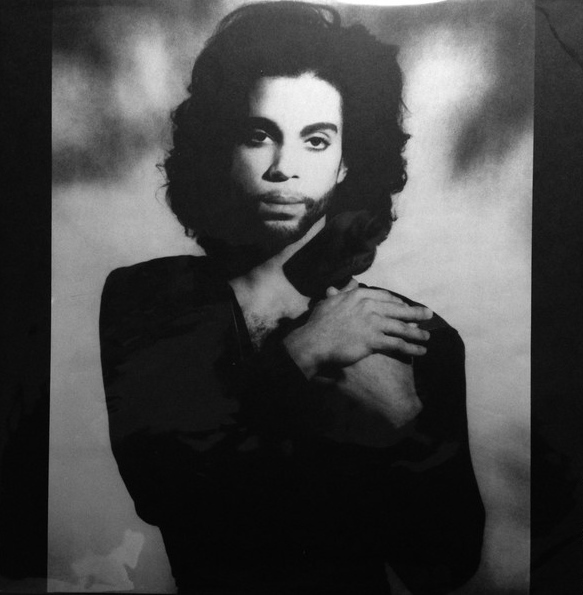 It sounds like 2 or 3 Prince albums are coming relatively soon. I'm pretty sure the glass is more than half full. For me the disappointment is not due to the fact I have it already, it is that they have decided to release something that is just so rough and beyond of few listens not really that entertaining. What I want to know is: Will the deluxe version also include a digital download? Probably they only will supply the zero's as download. I think we should all be happy that this is a release for diehard fans and that it is a preview of other piano & microphone releases. If it does well, then there will be more releases so we need to support it and spread the word. If it flops, then we will only get greatest hits configurations from here on at. I welcome a bold choice like this. I welcome any vault release, even if I already have this. But two things bug me. 1. Rather than mess with the recording to add alternative takes to offer something new, simply add them at the end. Don't tinker. 2. It's a wasted opportunity not to fill the disc space with other piano solos from the same 12 period (eg, Purple Music and Appollonias gift) especially if they don't really fit with any other project more than this one. Is the sound quite rubbish too? I’m listening to it with my good headphones and there’s a lot of hissing. So after 15 months we get 35 minutes of music we already had, is not very interesting and doesn’t sound great. But at least if you get the deluxe edition and pay £40 for it you get loner notes and a few photos. I for one LOVE hearing this release. To me, it shows what an outstanding songwriter and musician he was because of the **SPACE**. That's why I also have always maintained that Sign 'O The Times (the whole thing) was groundbreaking as well. It is awesome to be able to hear all of it - all of the nuance - in this release. I'm a big thumb's up over here!!! Christ, bought this on cassette in the early 90's...BUT i dont recognise the last Butterflies track! Interesting...choice...??? Who would want this to come out 1st after PR deluxe? What fan, money counter, or estate rep would think this was a good idea? Next up...this?? Even if you're motivated solely by greed - which I think has it's place, and be used to good ends - this choice seems like a damp fart. Maybe Troy Carter, who told Variety he was excited to talk about the "mind blowing" music he'd found in the vault, can shed some light? These tracks definitely have their place - I'd just assume as bonus content for a more substantial work.